Diesel fuel in a fuel tank can last the life of the generator – 30 to 40 years. It really depends on the maintenance that is kept on the generator in the fuel tank. It’s that ongoing maintenance that will answer the question “is my stored diesel ready for an emergency”. It’s really a matter of fuel contamination. Fuel contamination is a major cause of premature shutdown for standby engine generator sets, fire pump engines and other diesel engine support functions. As the length of storage period increases, the probability for premature engine shutdown due to either clogged filters, or excessive water entrainment, increases. Fuel contamination happens when it is exposed to something in the environment that accelerates the natural processes which attack its quality. 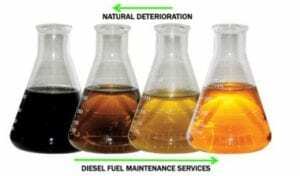 All petroleum fuel, whether gasoline or diesel, is made of a mix of molecules of different sizes and lengths. Fuel starts with a number of molecules that are unstable – the “precursors”. Over time, these precursors look to react with other molecules and start chain reactions that, given enough time, cause the fuel to form gums, varnish, and sludge, and become dark and stratified. As always (if your questioning the longevity of the diesel fuel in your generator tank). Duthie recommends bi-annual maintenance and of your generator and fuel tank.